"Let us manifest the taste of gentlemen." This is an excerpt from Erick Larson's, The Devil in the White City (pg. 196). Frederick Law Olmsted was famous for co-designing many famous parks including Central Park. Along with a man named Daniel H. Burnham, Olmsted redeveloped Jackson Park in Chicago transforming it into the fairgrounds for the 1893 World's Columbian Exposition. They had a very short amount of time and at this point in the book Olmsted was very ill, so he instructed his right-hand man, Ulrich, to not fear simple decor. "Let us manifest the taste of gentlemen." Well said. The painting above is featured in the exhibit called, Impressionism, Fashion, & Modernity that just opened in Chicago yesterday. 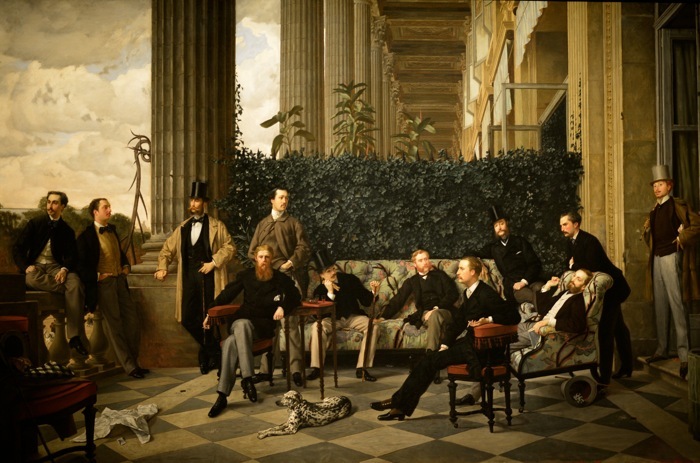 The painting is by James Tissot and it's called Le Cercle de la rue Royale (The Circle of the Rue Royal). I went to the exhibit with my sister and was blown away. I'll post more on the exhibit later this week.